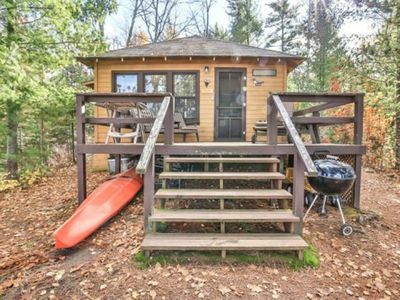 Beautiful, brand new in 2016, 3 bedroom, 2 bathroom condo #2 on Manitowish Lake, on the Manitowish Chain of 10 Lakes (4200 acres of lakes). Hickory floors, knotty alder cabinets, kitchen with breakfast bar and dining room table (with 2 extra leaves) Seats 10-12! 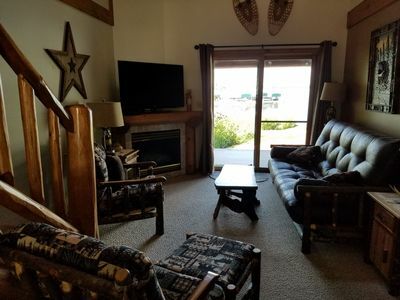 Cozy living room with leather sectional couch with recliner, flat screen TV, DirecTv, and freestanding Vermont Castings gas stove/fireplace. Three bedrooms upstairs sleep 9 in beds. 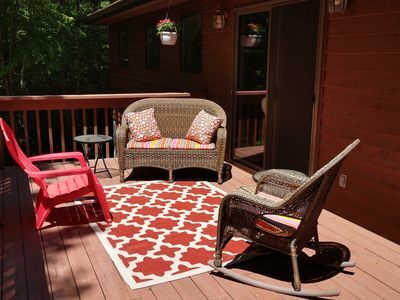 Plus a cozy twin daybed downstairs and a queen air mattress available upon request. Free wifi. Washer and dryer. Central Air. Swingset and slide for the kids, private firepit with chairs. Weber gas grill for Dinners 'in.' Propane included. 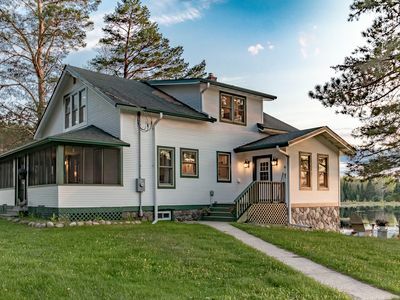 Stunning lake views from living room, kitchen/dining room and both master bedrooms. 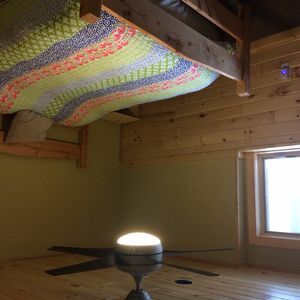 Third bedroom has great woods view. 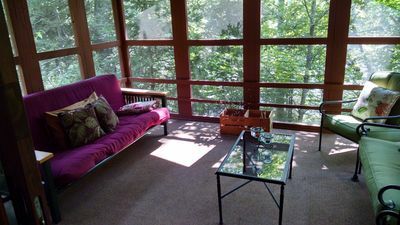 Condo is located very close to lake (about 5 steps from lower deck to the lake stairs), with huge upper and lower decks. 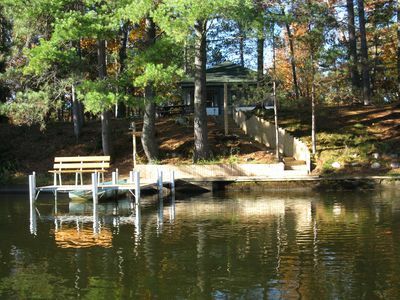 Private steps to lake and private permanent pier. 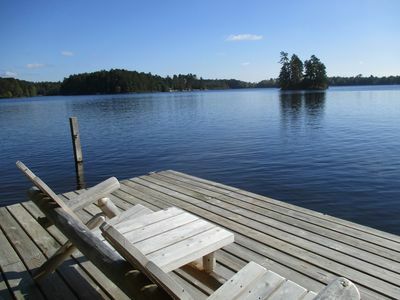 Watch beavers, eagles, loons, turtles, ducks, deer,and more wildlife right from the dock! 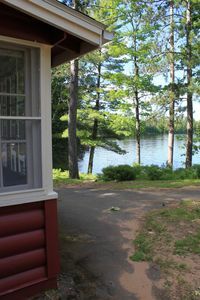 Sand frontage is great for swimming right off the dock, canoeing, tubing, kayaking, paddleboarding, waterskiing, fishing. Canoe and paddles available free for your use. With 10 connected lakes, you can get to the beach, town, restaurants, and the ski show all via water! 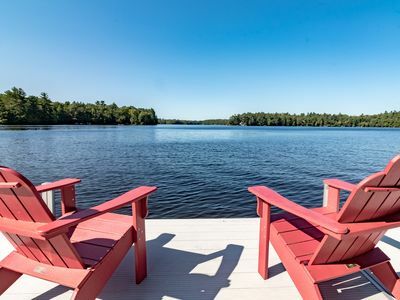 ***New for 2018***Available for rent to our guests: pontoon boats, kayaks, and stand up paddleboards. Delivered to your shore! Please contact the owners for rates and reservations! Library, airport, playground, driving range, baseball diamond, platform tennis courts, and tennis courts 1.5 miles north on Hwy 51. Greer's Pier boat launch and marina is located conveniently across the street. Bike trails and hiking nearby. 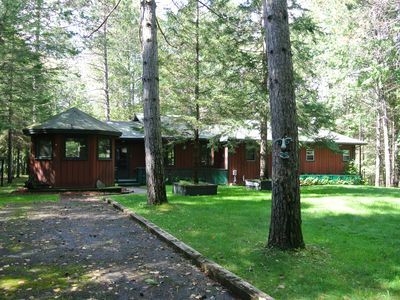 The North Lakeland Discovery Center has 12 miles of hiking, biking, groomed cross country skiing, and snowshoe trails. You can also kayak, canoe and fish on Statehouse Lake. Naturalists on staff offer learning adventures/programs for adults, family and kids. The Winman trails offer hiking and mountain biking, fatbiking, snowshoeing and cross country skiing. Amazing groomed trails and nice warming hut. New paved biking trails connects Manitowish Waters, Boulder Junction and Sayner. Manitowish Waters is also a great destination in the Fall. Hunting and hiking and biking, fishing, boating, awesome fall color!. It's also known for its Cranberry Harvest. Many of the local cranberry growers offer marsh tours. 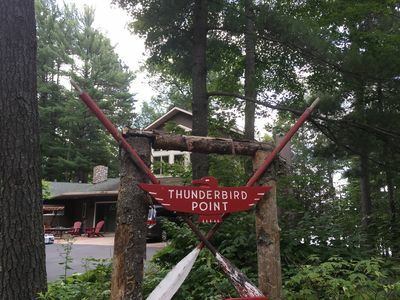 A great Winter getaway as well, located just south of Indianhead, Blackjack, Whitecap and Powderhorn downhill ski resorts in the Upper Peninsula of Michigan. Great skiing and old school charm! 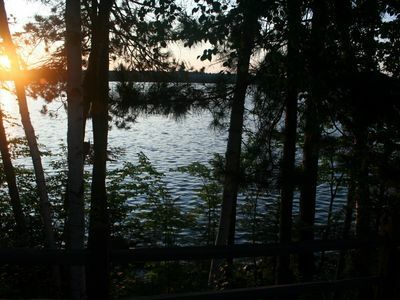 Manitowish Waters is one of the most popular snowmobile destinations in northern Wisconsin! 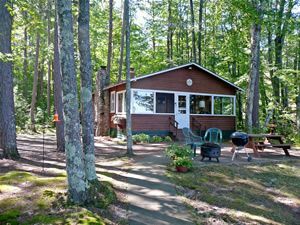 Condo is conveniently located directly on the snowmobile trails! Snowshoeing on the lake and woods is great! Ice skating! Hockey! Ice fishing! Peaceful walks in the woods! Hot chocolate and warming beverages at local pubs! Great restaurants! Small town charm! Plenty of snow for everyone. 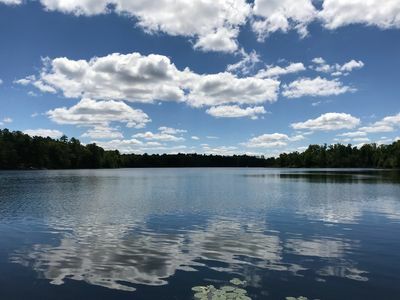 Condo is in a great location, easy to get to, just 25 minutes north of Minocqua, and 3 1/2 Hours straight north of Madison. 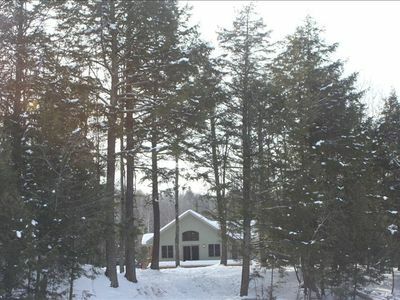 On Hwy 51, Just 4 minutes by car to downtown Manitowish Waters. 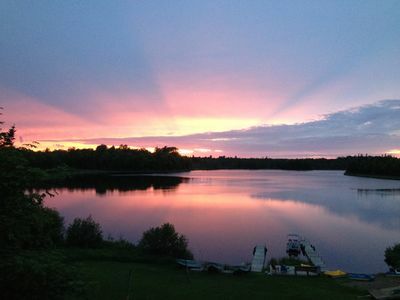 Take the boat out to eat at any one of several great restaurants/taverns, to cruise all 10 beautiful lakes, or to town. 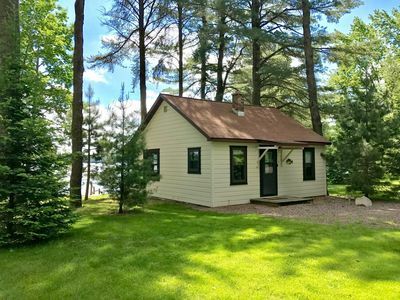 Lakeside Cabin - Enjoy Peace, Quiet, + Scenery of the Northwoods! 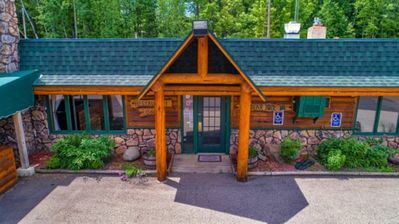 Spacious Rustic Lodge - Excellent for Large Groups & Events! 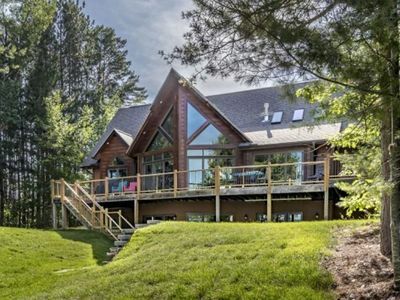 Grand Getaway - New Luxury Family Friendly Home Listing on Rest Lake! 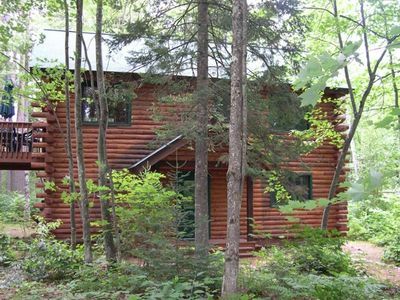 Private Cabin in Charming Northwoods Resort on 3 Lake Chain! Epic Summer Fun!